Would you like to connect your forms to your Drip account? 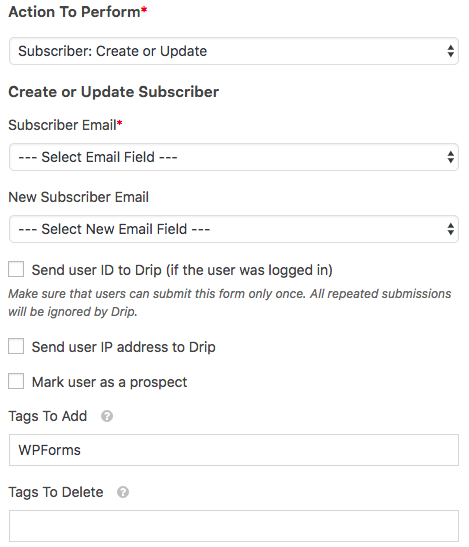 With Drip integration, you can automatically add users to your email marketing campaigns when they submit forms on your site. You’ll also be able to easily set up additional options like allowing subscribers to update their email, recording custom events in Drip, and more. 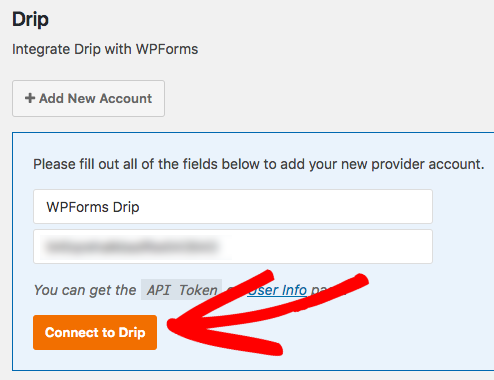 In this tutorial, we’ll show you how to use our Drip addon to integrate WPForms with your Drip account. Requirements: You will need a Plus license level or higher to access the Drip addon. Once the core WPForms plugin is in place and your license is verified, you’ll be able to quickly install and activate the Drip addon. 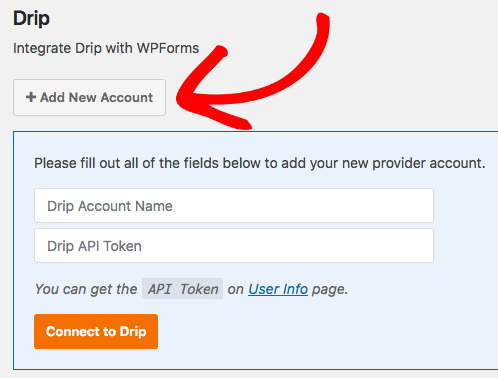 Now that the Drip addon is installed, the next step is to integrate WPForms with your Drip account. 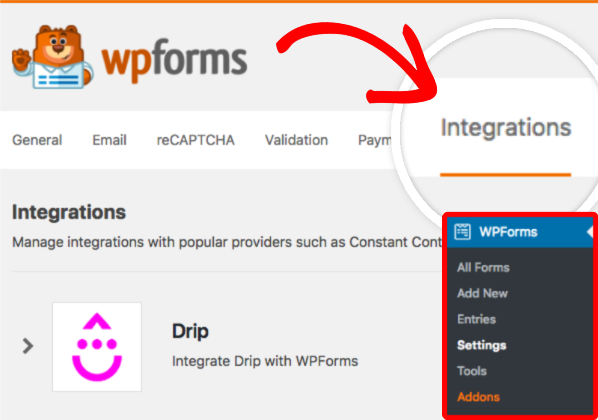 To do this, you’ll need to go to WPForms » Settings and then click on the Integrations tab. When you open the Drip option within this tab and click the + Add New Account button, you’ll be able to two additional fields. Within Drip Account Name, you can add any name you’d like. This is for your internal use only, and can help if you add more than one Drip account. Below this, you’ll see the Drip API Token field. 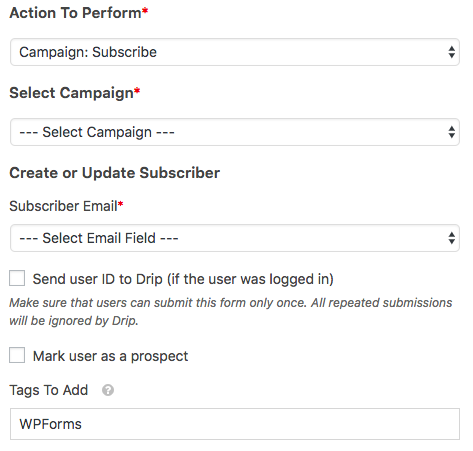 The API is what allows the WPForms plugin on your site to communicate with your Drip account. Each Drip account will have a unique API token. To access this, you’ll need to log into your Drip account. Since we’ll come back to your WPForms settings later, we recommend opening the Drip site in a new tab or window. Once you’re signed into Drip, you should automatically be taken to the User Info page. 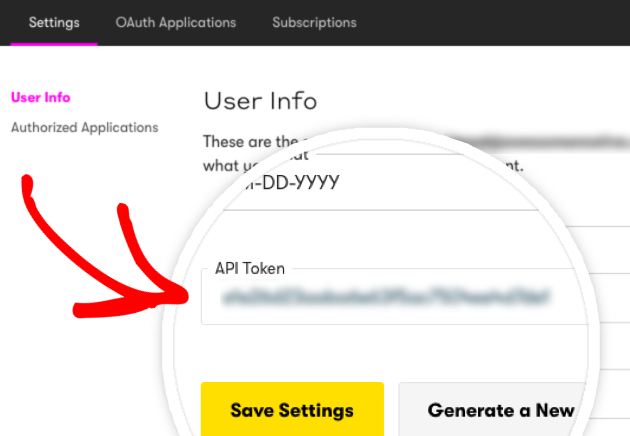 Towards the bottom of the page, you’ll be able to copy the API Token. Once you’ve copied the token, you can return to the tab or window with your WordPress settings and paste it into the Drip settings. When you’re ready, click the Connect to Drip button to save the connection. Once these fields are saved, you should see a green box that says Connected. The next step is to add Drip integration to specific forms on your site. To do this, you’ll need to create a form or edit an existing form. 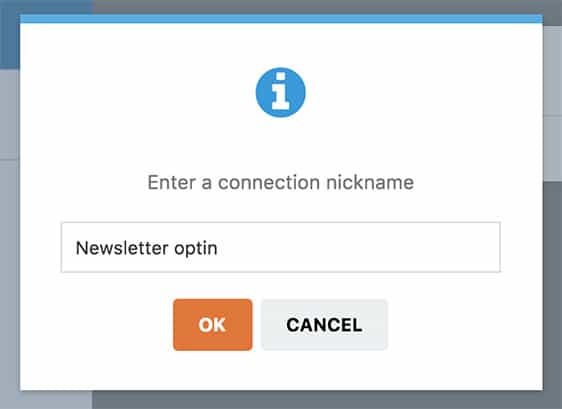 After opening the form builder, go to Marketing » Drip and click the Add New Connection button. After clicking this button, an overlay will appear. Here, you’ll need to enter a nickname for the connection you’re creating. This is useful if you plan to connect this form to more than one mailing list, however it’s only for internal use and your users will never see it. Once a connection is created, additional settings will appear. First, you can use the Select Account dropdown to choose from any accounts connected in the previous step. Next, you’ll need to select an Action to Perform. The action you choose will determine which options appear next. The action you choose will depend mainly on whether you’d like to add/update or remove subscribers. We’ll cover each of the available actions, and their related options, in more detail below. This action will simply add a new subscriber to your Drip list, or allow you to update an existing subscriber. However, this will not automatically add the subscriber to any campaign. You want to build a subscriber list, but don’t have a campaign ready yet. You want to let existing subscribers update their email address through your form. In addition to create a new subscriber in Drip, this action will also allow you to immediately add the new subscriber to an existing email marketing campaign. When to Use this Action: You have a Drip campaign created, and want to add these subscribers to that campaign immediately. Just like the above actions, this will create a new subscriber in Drip. Additionally, however, this action will add an Event to your subscriber. In Drip, Events are used to track the activity of your subscribers. 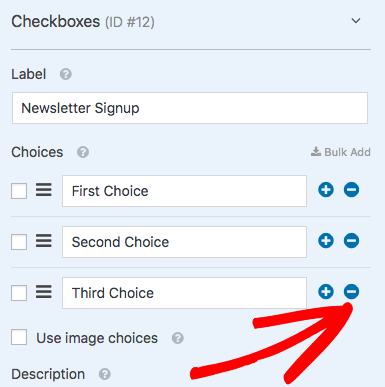 For example, you may want to create a specific event to indicate that your subscriber submitted the form you’re creating. When to Use this Action: You already use/intend to use Drip Events to segment your subscribers. For more details on what Drip Events are and how to use them, please see Drip’s Events tutorial. Subscriber Email: The email to use for a new subscriber. Or if updating a user, this needs to be the email they originally subscribed with. New Subscriber Email: (Only used when updating an existing subscriber) The new email when updating an existing subscriber. Send user ID to Drip (if the user was logged in): Drip assigns all users an ID number. Check this box if you’d like this ID number to match the user’s WordPress User ID. Send user IP address to Drip: To learn about what an IP address is, please see WPBeginner’s tutorial. Mark user as a prospect: This will flag subscribers so you can easily target leads within Drip. 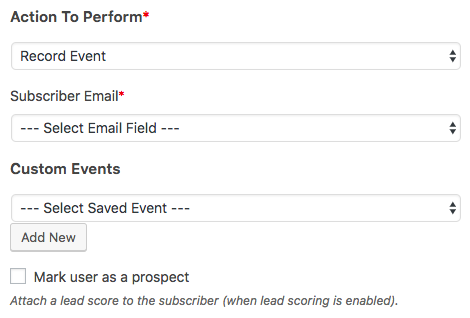 Starting Lead Score Value: (Only visible when Mark user as a prospect is checked) In Drip, a lead score indicates a subscriber’s engagement level. For more details, be sure to check out Drip’s tutorial on lead scoring. Tags to Add/Delete: You can use tags in Drip to easily identify and segment users. This action will allow your subscribers to remove themselves from your Drip list. 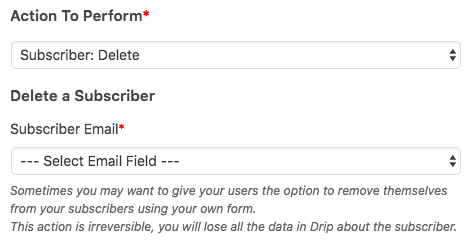 When to Use this Action: This action should only be used if your form is specifically intended to allow subscribers to delete themselves completely from your Drip account. This action will let your subscribers remove themselves from your Drip campaigns. 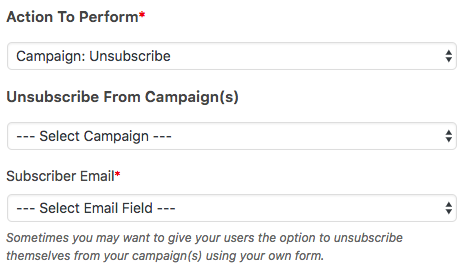 Unlike the Subscriber: Delete action, this option will allow subscribers to be removed only from either one specific campaign, or all campaigns. However, the user will still exist within your Drip account. When to Use this Action: This action should be used if you’d like to let users unsubscribe from campaigns (but not remove themselves from your Drip account altogether). Conditional logic allows you to set rules for events based on the user’s selections in their form entry, creating a “smart” form. 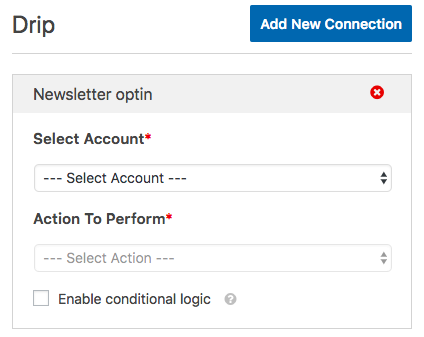 For example, conditional logic can allow users to choose whether they’d like to be added to your mailing list(s). To set this up, we first need to add a Checkboxes field to our form. For our example we’ll only need a single checkbox, so we can remove the extra checkboxes by clicking the – (minus) icon. Then we’ll adjust the text. For our example, the checkbox text will read Please keep me updated with weekly newsletters. Next, we’re ready to add smart logic. To do this, we first need to go to Marketing » Drip. At the bottom of these settings, checking the box labeled Enable conditional logic will display additional options. As the last step, we’ll need to set up our conditional rule. 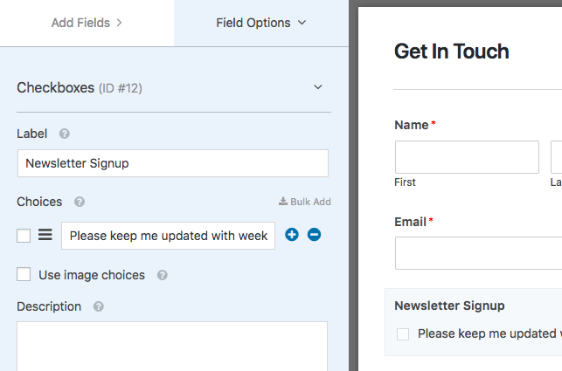 For this example, our logic will be: Process this connection if Newsletter Signup is Please keep me updated with weekly newsletters. Now we just need to save our form, and our logic is all set. That’s it! You can now set up Drip integration with any forms on your site. Would you like ideas on how to encourage more users to subscribe? Check out our tutorial on leveraging lead magnets for details on how to offer incentives to tempt potential subscribers. Fixed: Drip API library not properly loading. Added: Ability to add a Drip account from the Form Builder. Changed: Lead Score field is now visible only if the Prospect option is checked. Changed: Improved settings screen description and helpful texts. Fixed: Multiple conditional logic rules now works fine for different Drip connections.